The temperature's dropping and I'm longing for comfort food to banish the winter chill. 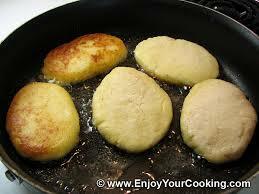 What could be better than potato cakes? Especially when they're so easy to make. They're great as a side dish, and since my version has protein (Greek yogurt and shredded cheddar) you could even have them for lunch with a salad and not feel too guilty! 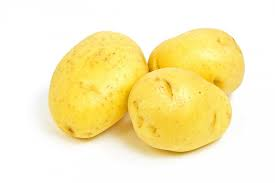 You start with Yukon Gold potatoes, which happen to be my favorite. 1 and 1/4 cup Panko bread crumbs (divided). 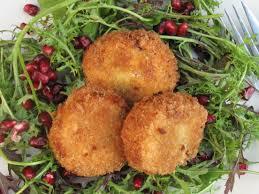 Use Panko, they give a crunchier flavor to the potato cakes. Start by chopping the potatoes into 1 inch pieces. Place in a pan of water, bring to a boil and then reduce heat and let them simmer for about 20 minutes until fork tender. Drain and place in mixing bowl. Add the yogurt and chicken broth and mash. Now add the cheddar and 1/2 cup of the Panko bread crumbs to the mixture. (you are going to use the rest of the Panko crumbs for the breading) and mash again. Add the scallions and salt and pepper. Heat some vegetable oil in a skillet. 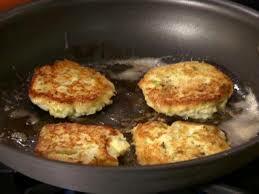 Form the potato mixture into cakes and dredge with Panko. Place in skillet when oil is hot. They take about 3 or 4 minutes to cook on each side. Remove from heat and enjoy! I hope you like this recipe as much as I do. Labels: Berkley Prime Crime, cozy chicks, Mary Kennedy, potato cakes, recipe for cold weather.